Scientists are asking if we can turbocharge our time perception. 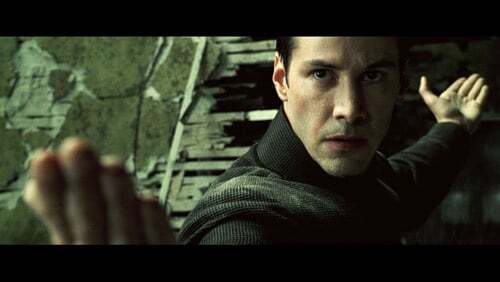 In The Matrix, hero Neo wins his battles when time slows in the simulated world. In our real world, accident victims often report a similar slowing of time as they slip unavoidably towards disaster. We’ve all heard stories of people seeing things happening in bullet time or reviewing their entire about-to-end lives, but if we could toggle this tachypsychian switch by choice it’d be a real-life superpower. The first question is “Can our consciousness affect our awareness of time?”, which is a tautological yes – of course our ability to be aware of things affects our awareness of things. The fantastically named Professor Eagleman is going further: he wants to find out if time really does slow down for subjects, no matter how many people he has to strap into experimental hardware and hurl off buildings.The hardware is a “perceptual chronometer”, an LED screen whose patter flickers slightly too fast to make out – it hops between patterns like “3” and “E” but looks like “8” to anyone operating at regular human speed. The “hurling off buildings” bit is SCAD, Suspended Air Catch Device, an activity which berates bungee jumping as wimpy because the latter allows people to slow down. In SCAD jumps you fall off a shaky ledge thirty meters up and fall full speed into a net. Unfortunately the results are against creating the Flash anytime soon: while test subjects did recall the fall taking longer than it actually did, none could perceive the changing pattern on the watch. This would indicate that the effect is an artifact of memory – the brain writing more data more powerfully than normal, so the recollection seems to last longer than non-traumatic events. The problem is that this temporal effect is the ultimate in subjective data – literally so, as the brain often thinks it’s the last thing it’ll experience. So when you remember things happening in slow motion, it’s the remembering that provided that – not the original event. Of course there are a thousand and one other factors which could influence this experiment – maybe the brain can deal with data faster, but the frame-rate from the eye doesn’t increase. Perhaps the subjects were simply too scared. Or it could be that SCAD just isn’t the right way to trigger the temporal boost (in which case God help Eagleman‘s next victims). There have been cases of people perceiving time differently under cranial magnetic stimulation, or the effect of tumors, but so far they’ve all resulted in slowing down or simply breaking previously observed effects – it seems that overclocking ourselves isn’t an option yet.